Kenneth Dalton is the founder of Our Story, Inc.. The tagline of his organization's website is : "Sharing the Stories of the Unsung in Northern Nevada Since 1996." Dalton's mission with Our Story, Inc., is to seek out, collect, preserve and exhibit the contributions, heritage, culture, and accomplishments of people who have not been well represented in Northern Nevada’s public image. 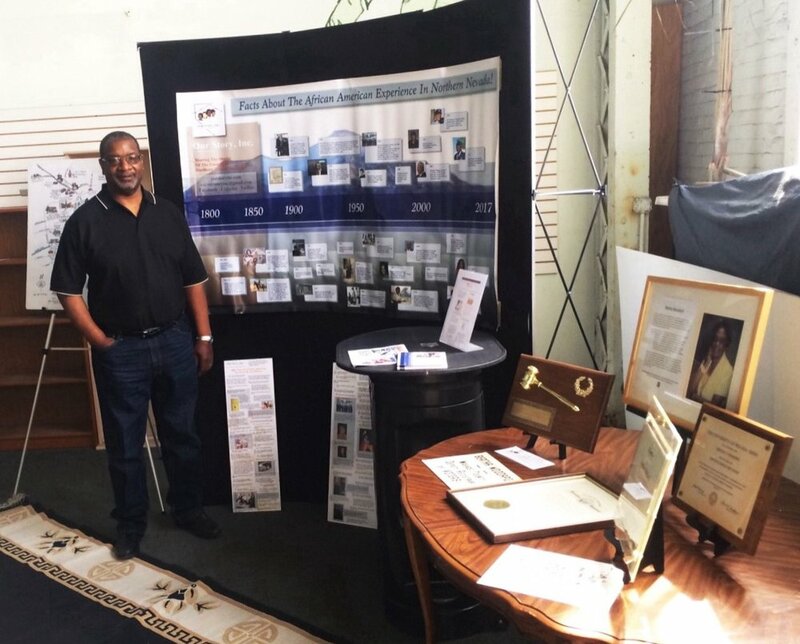 Artifacts and memorabilia in his possession include those of boxing legend, Jack Johnson, and activist Bertha S. Woodard, who petitioned the Reno City Council in 1959 to lift a ban on minorities in local casinos. A Tacoma, Washington native and former firefighter in Reno, Dalton has been living in the Biggest Little City since the mid 1980s, where he's also coached football and track. He sat down with Our Town Reno reporter Prince Nesta and Emily Hodge for a recent interview. 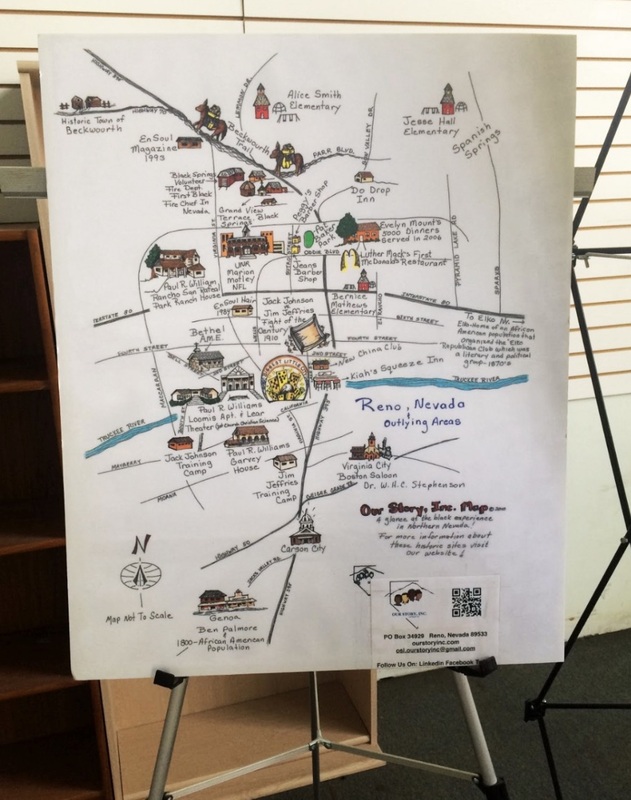 A map created by Our Story, Inc., outlines some of the black experience in Northern Nevada history. Q: When did you start preserving the history of minorities in Northern Nevada? Dalton: When I came to Reno in 1985, I was one of the six first African-American firefighters in all of Northern Nevada. I was like, 'that’s ridiculous.' In my quest to find out more about that history, I started seeing some other things that happened in Reno like, the fight of the century. I could ask ten people if they had heard about the fight of the century, when Jack Johnson came to fight in town and helped put Reno on the map and they all said they had never heard about that. Most of them only knew about Harriet Tubman or Martin Luther King. So, I thought it was important to remind people that we have people right here that have made a difference not only in our lives but in other people’s lives in the country. Like my good friend and board member, Andre Berry, one of the first black generals or the first black general for the state of Nevada. He lives right here and most people don’t even know that, but are always quick to question where I heard that from. I’m like, you can go down to the library and find out. Q: What are some of the important artifacts that you have preserved in your organization? Dalton: Some of the artifacts that we’ve preserved is how we stay true to people like Paula Williams, an African American architect, who largely based his practice in Los Angeles, but designed structures in Northern Nevada including; the Lear Theater, the Garvey House, the Rafael Hermon House, the Loomis Apartments and El Reno Housing Project. Bertha Woodard, one of the founding civil rights activist in this community and also known to have petitioned the Reno City Council in 1959 to lift a ban on minorities in local casinos, personally left me her memorabilia to preserve. We’ve also kept the personal history of Jim Beckwourth, an African American who was very important to this community by playing a major role in the early exploration and settlement of the American West. We went up there and took pictures of the trading post that he built. It’s about 40 miles north from here, out through Hallelujah Junction. We have also preserved the history of Ben Palmer. He was one of the first black ranchers in the Carson Valley. In fact, one of the first ranchers, period. Let’s take the black off of it. If you go to Carson City and pull up all the people that were paying contribution and taxes at that time you’ll confirm what I’m telling you. 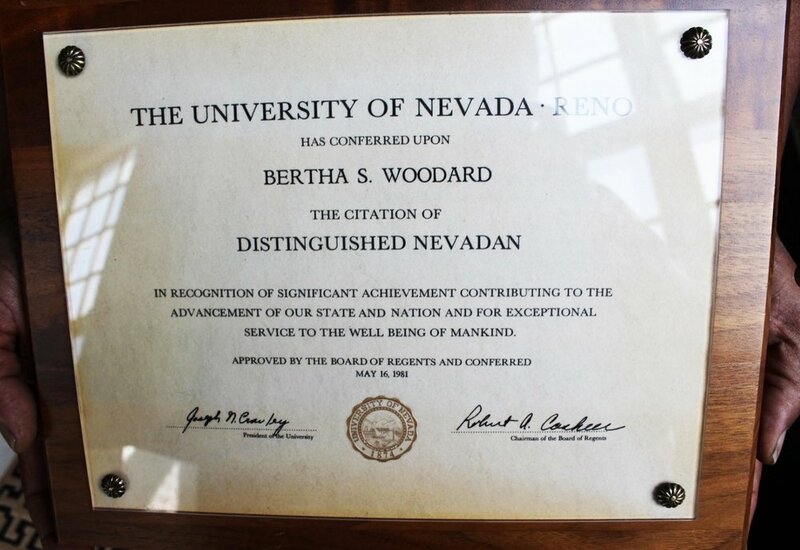 Dalton holds the framed certificate issued in May 16, 1981 by the University of Nevada, Reno and approved by the Board of Regents recognizing civil rights activist Bertha S. Woodard as a distinguished Nevadan. This is just one of her plaques and awards that is in Dalton's possession. Q: Who finances the organization? Dalton: I finance this project. I also have friends who donate money. That’s it. We don’t get grants. Nothing. It gets a little expensive but I think it’s important. When we get some funding, we also have to be careful because when you get a certain amount of funding people expect certain things, you know. Q: Apart from funding, what are some of the other challenges that you face as an organization? Dalton: Some community members don’t value history. They say 'That’s old stuff, that don’t mean nothing.' I also don’t have enough people on board and it takes a lot of work to research, and money. Also, I’m not a historian as such. I don’t have a degree in history. So a lot of times, better historians say, 'Well you know, you don’t have the qualifications.' Yes, I don’t have a degree but I do have a historian on my board who has a PhD in research work. So I’m attached to people that do research. What I’m doing right now is just to tell you and then maybe that will inspire you and then maybe you’ll go find out a little bit more of what you heard. “I’m also looking for somebody else to get the passion that I have because this is important and we need to keep this organization going. Hopefully you’re interviewing me and you get inspired enough to get involved and maybe you’ll be the one to take it over and take it to the next level. If I stop doing it who’s going to do it? Who do we have out there? I don’t know." Dalton asked for help during his interview with Prince Nesta. Q: So, if I have a historical artifact or information, what process do I need to follow? Dalton: Well, send us an e-mail or contact us. Hopefully you’ll have some kind of references or something that we can check and then we follow up on whatever the information is. We’re not going to put it out there in the world of fake news until we follow up and counter-check its authenticity by going through records in the library, public records, newspapers and whatever we have access to. Q: What if you still can’t find the information? Dalton: We always wait until we come up with a more substantiated piece of information. If somebody else has more information they can always feel free to send it to us so that we can follow it up. I mean that’s about the only thing we can do. Q: What are some of the most exciting moments that you’ve shared as an organization? A screengrab from the front page of the Our Story, Inc. website. Q: Where do you see your organization 10 years from now? Dalton: That’s probably one of your best questions that you’ve asked all day. I hope to see it still functioning. I hope to see it expanded and keeping up with the times. Particularly how we disseminate information. We want to be at the forefront in the African-American experience in Northern Nevada. A dependable site for the history of minorities. Since 1996, we haven’t also had a physical location. We keep most of our artifacts at home and some at the Nevada Historical Society. It would be nice to find someone to finance or donate a physical building where we can keep all the artifacts and memorabilia. I mean, you know, it’s pretty expensive right now to get to a place or to be able to pay somebody to be a curator and all of that. I wish that we could have that in 10 years. Q: How can people find your organization? Dalton: Through our website, ourstoryinc.com. You can go through our site and if you see some information on the website and you think that you know something, send it to us so that we can adjust what our information is. People should also feel free to write and send us any new information as long as we can verify its legitimacy. We can also give them their own area on the site to talk about history. I mean that’s what it’s about, the history of the Northern Nevada community. Dalton: I’d like to be remembered as a person that was passionate, fair and treated people the way he wanted to be treated. That’s pretty much me.